About seven or eight years ago, I bought a home gym. This past weekend, I got rid of it. But the standard jokes about buying/ditching exercise equipment don't hold here. Instead, I consider our home gym transitions to be a totally happy story. My frugal hero, Amy Dacyczyn of the Tightwad Gazette, once wrote about "temporary ownership": buying used things (like high chairs) at yard sales to use for a little while, and then reselling them a few years later when your family has outgrown their use. I love the concept, but the name she gives it reminds me too much of what my errant neighbors do: buy something new at a store and then send it to the landfill after a few years. Yuckers. So, I'll call this process of moving things from one home to another serial ownership instead. 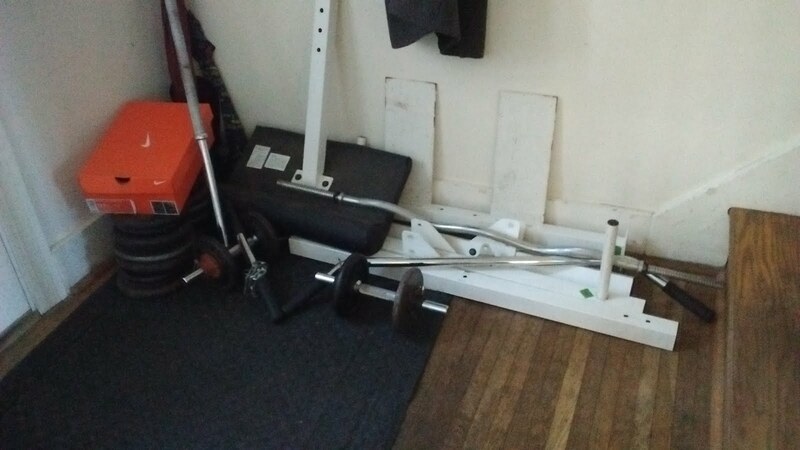 About seven or eight years ago, I bought a home gym off of Craigslist. I'd been influenced by a Mr. Money Mustache article (Get rich with: olympic barbells), but I was also harkening back fondly to my college days when I was on the swim team and used to work out in the weight room at our gym regularly. 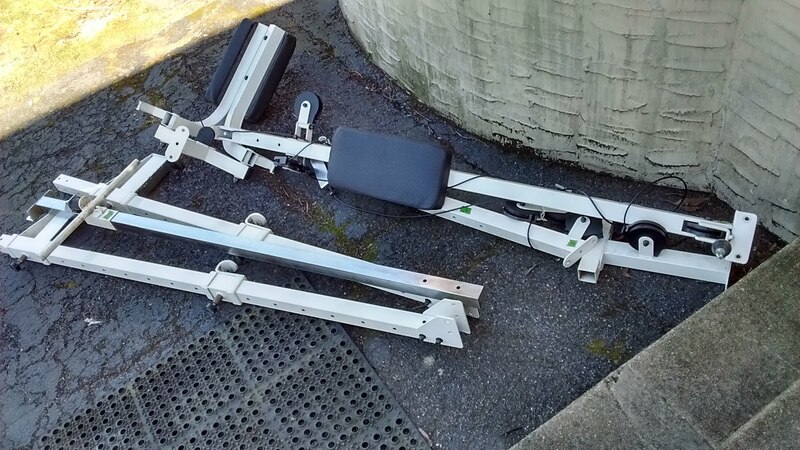 One spring day seven or eight years ago, I took a peek at Craigslist, saw one guy offering a home gym with a bench and large weights and barbell-bars and pull-down bars and other cool things I remembered loving using. For $100, I got the complete set, and we carted all the pieces into the basement, assembled it (wenches with wrenches! ), and it's resided there since. Since then, the home gym has gotten off-and-on use through the years. It helped me a bit as I trained for the Iron Man; it helped me a lot as I recovered from a broken arm and got myself back up to doing 50+ pushups for my 50+ birthday. I've gone through phases where I didn't use it much, and other phases where it's been a regular part of my routine. As for my sons, they've also been irregular but avid users of the gym. J-son in particular pumped a bunch of iron on his way to becoming a boxer. He had gone through a social phase off feeling totally uncool because his buddies had all the cool video technology toys and he didn't -- but when he started lifting at home and bulking up, those same buddies started visiting our place so they could work out, too. So he had a "cool" thing that no one else had. In fact, the effect this gym had on J-son might rank up there as one of the best overall choices we've made in parenting him. Those are the positives. The negatives are that this thing takes up a bunch of space, which is a liability as we start looking for a smaller home to move to. And also, this gym had everything I wanted and more, meaning that it had a bunch of extra features I never ended up using. But this is one of the real advantages of serial ownership: I nab something from a yard sale or Craigslist or Freecycle when I don't really know what I'm doing, meaning I don't really know what it is that I'll like or not about it. And after owning it for a while, I learn. I learned I like bicep curls; I don't do those arms-together squeezes. When I got my SodaStream (for less then the retail cost of refilling the cylinders, even though it had one full cylinder and one half-full cylinder), I learned that I like fizzy water, but I don't like plastic bottles. The more I nab clothes out of yard sales, the more I learn that I really like knit dresses, and not so much tight-weave dresses. And then, armed with this new knowledge, I can safely move these things into their next owner's homes, and work on upgrading (or downgrading, if appropriate) to something that suits me better. but I didn't take a picture of that. A week or so ago, my husband listed the home gym on Craigslist for $75. We'd already given one set of small dumbbells and weights to my oldest daughter, and we'd gotten a bunch of use out of the set, but otherwise it was just as great as the day we'd brought it home. A family with two preteen sons who play football was looking to purchase. So I disassembled the gym. (Wenches with wrenches!) And we moved the entire set into the new family's vehicle, and I waved goodby. So, for $25 plus opportunity cost, we got more than a half-dozen years of good workouts and enhanced muscles for me and my sons, plus a set of hand weights for my eldest daughter. We removed the gym from the home of a guy who no longer wanted it; we placed it in the home of a family who anticipates having as much fun with it as we did. I love this whole process!